Claudia Hart, Flower Matrix Augmented Lounge , 2018–19. Installation view. Miller ICA at Carnegie Mellon University. Courtesy of the artist. I first encountered the work of Claudia Hart in 2009 at the now-defunct (but much beloved) Jack the Pelican gallery in Williamsburg, Brooklyn. That work, a video piece titled Ophelia , was a single static shot of an inert 3D-animated female figure suspended underwater; it seemed to connect the dots between digital art, painting, and sculpture in one simple and direct composition, and it made me an instant fan. Since then, Hart’s work has expanded in scope and technological complexity. We didn’t actually meet until several years later, on the occasion of her projection-installation The Dolls House at Brooklyn-based Transfer gallery; shortly thereafter she invited me to participate in her collaborative online/exhibition project The Real-Fake . Even though Hart resists being called an “animation artist,” the complex flux and interchange between material and virtual “objects” across her bodies of work are for me perfectly exemplary of an expanded digital moving-image art practice. 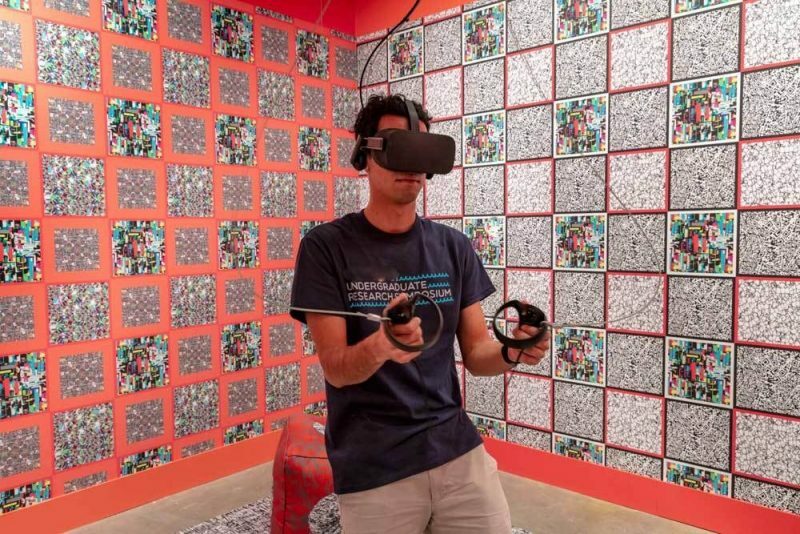 Sean Capone I’d like to start by discussing the new version of the installation The Flower Matrix (2017) as part of the group exhibition Paradox: The Body in the Age of AI at Carnegie Mellon University. Can you give a quick breakdown of what this is? Claudia Hart The idea of The Flower Matrix is to create a lounge for viewing virtual reality. What this means is that you experience the immersive experience of VR in which you walk into a simulated environment and feel, phenomenally, that you’re in it. I wanted to bring that a step closer to the real world. What’s interesting about the simulation technologies that I use as opposed to traditional “flipbook” animation—because I don’t think what I do is animation but more like simulation—is that the experience of 3D environments is a phenomenal experience, a trompe l’oeil experience. When you build both a physical environment for viewing it and a virtual environment, you feel like you’re in a realm halfway between real and unreal. You’ve entered this “gateway zone,” which is a kind of fantasy, imaginative, or Heaven-like dream space, and in that space you build things, and you set physical processes and allow them to take on physical properties as real objects do in the real world, and then live their own lives. This is a totally different relationship in terms of hand-drawn animation, which is more of a subject-object relationship. SC But in 3D animation, you’re not drawing things either. You use automated processes to give the appearance of space and movement. Isn’t that already a rupture from traditional animation? CH I think it’s something else entirely depending on what you emphasize. I don’t consider myself a “character animator,” but I do work with digital bodies. I work with physics. I’m not actually interested—I reject out of hand, actually—the old-fashioned animation strategies of tweening and creating “good” animation. What’s amazing to me is creating automatons—giving them life to go and do things on their own. Instead, I set up physics environments in which the bodies are acted upon by forces. There’s very little traditional animation involved. I mix simulations technologies with motion capture. I capture motion data with sensors attached to real bodies and submit those to physical simulations. It’s closer to making robots than to making a flipbook. SC In a way you’re still an “animator” but one who skips the history of cinematic animation in order to go back to the original sense, the alchemical concept of animating or simulating life: Frankenstein, the golem, the homunculus, that kind of thing. CH Exactly. And I think you could trace the history back to eighteenth-century automatons and early robotics. All of these things I was fascinated by before I did 3D.